Lyotropic quaternary mixtures of some tetradecylalkylammonium bromide surfactants were prepared to examine the effect of the size of the surfactant head group on the stabilization of different lyotropic nematic phases. The lyotropic mixtures were prepared by the addition of the tetradecylalkylammonium bromides (TTAABr) in the mixture of NaBr/decanol (DeOH)/water. The uniaxial to biaxial nematic phase transitions were determined via laser conoscopy. Some micellization parameters such as critical micelle concentration, degree of counterion binding and micellization Gibbs energy were evaluated from the electrical conductivity measurements of diluted binary surfactants/water solutions. 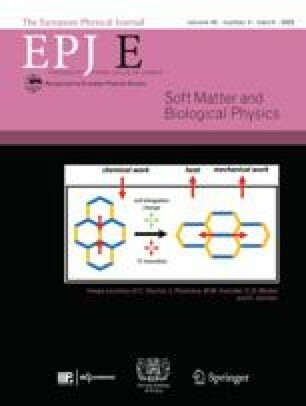 The results indicate that the head-group size of the surfactant molecules influences the amphiphilic molecular aggregate topology. 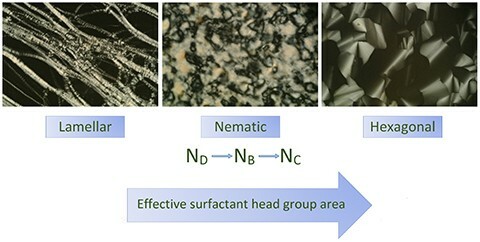 Moreover, the effective area per surfactant head group is a key parameter on stabilizing the lyotropic biaxial nematic phase.